December | 2010 | okay, peanut. I don’t know about you, but I’ve got a horrible memory. It’s seriously lacking, and it’s totally not cool. If I relied on my memory to do my holiday shopping, I’d have $500 worth of gifts for my sister and nothing for my husband. Okay, perhaps that’s an exaggeration, but I know I’d end up with too much for some people and not enough for others. A few years ago, I started carrying a tiny notebook around with me. I’ve adapted the concept over the years and have finally come up with a solution that works perfectly for me. So yes, I just set up my holiday notebook for the 2011 Christmas season. This 60-page, 3″x5″ spiral-bound notebook will be my best friend over the next 12 months. The key for me is to not only record what I’ve purchased for my special someones, but to also write down ideas for those on my list. I have two pages for each person – a page for ideas, and a page for purchased gifts. On the purchased page, I’ll include the total paid for each item so I know I’m not over/under-spending. The ideas page is great when crunch time comes along … and believe me, there’s always a crunch time each year! Another great idea – a colleague takes a picture of each gift she buys throughout the year, immediately wraps the item, and keeps all of her information in a spreadsheet. Huge advantages – (1) her gifts are wrapped early, (2) she’s got an easy-to-reference photo of the gift, and (3) she’s got a spreadsheet with all of her ‘need to know’ information. Awesome! What tricks do you use to plan your way through the holidays? Please share! 2010 was an amazing year – plenty of celebrations, milestones and firsts … and a few sad happenings mixed in, as well. … new jobs for both the hubby and I. The Mr. is pleasant and under minimal stress. I left a really bad situation and am realizing just how much I needed a fresh start. … a growing little one. Oh. My. Heavens. I might change my mind this time next year, but 2010 could have possibly been the best year ever with that girl. I found my place as a mom and learned to appreciate every single second with our free-spirited girl. Lily learned to walk, is really starting to learn words, and understands so much of what we tell her. She’s starting to pretend, too, which is so much fun! … Snowmageddon. How could we forget that? Two ridiculous snowstorms that dumped over 5 feet of snow in a matter of weeks. It was exhausting. … two huge pet losses. Our family dog, Daisy, left us early this year. A few weeks after we lost Daisy, we learned that our dog, Cody, had prostate cancer. We spent just over 2 months with him before we lost him on July 22. It was devastating. … a new dog, Huck! We adopted Huck a few weeks before we lost Cody. 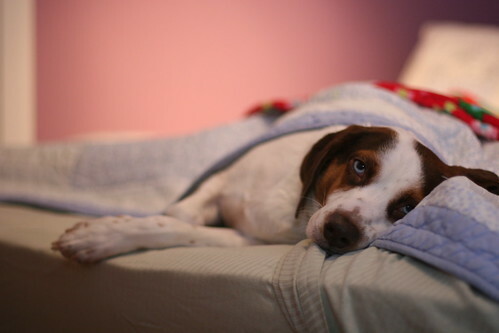 Huck’s a beagle & brittany spaniel mix, and he’s a lot different than Cody, that’s for sure! He has certainly settled in and found himself a home. … another family member! Our niece Cypress was born on 8/1 and is perfect in every way! She’s loved by her two big brothers, that’s for sure. … travel. I finally made it to the west coast, though I didn’t get to spend any time discovering the state of California, as it was a work trip. At any rate, I have a few more states to add to my list of places I’ve traveled. We also went to Florida for a week with my family – all of us! It was awesome! … a couple of weddings, at least one funeral, and babies (No, not for us, silly!). … a new hobby – knitting! I’m certainly still a beginner, but am finding fun in knitting. I know there are things I’m forgetting – perhaps I’ll add to the list as I think of things. Looking back, 2010 was a great year, and it can only leave me looking forward to 2011! We went to dinner tonight at a local pizza shop. It’s a small place, 15 tables or so, and tonight it was covered by only 1 waiter and 1 waitress. Seriously, the place was packed the entire time. And from what we noticed, the waiter had 2 tables and the waitress was covering the other +/- 13. Thankfully, we were one of her 13 (And ironically, we were at table #13.). She wasn’t extraordinary for us alone. She was spread entirely too thin and didn’t have time to be fabulous for us alone. We felt for her – she was oh so busy. And through that chaos, I could tell she would have been just wonderful if she’d had the time. She had great energy, but was understandably tired. I hope I made her smile. I leave little ‘treasures’ for fabulous waiters and waitresses. But they’ve really got to be fabulous. Very friendly, extremely attentive, and on their game. They have to just have it. For these awesome people, I leave a note – the back of a receipt (The itemized one, of course.) or a clean napkin are the two usual suspects. I wish them a good day, tell them they are wonderful, or wish them a good holiday. Our waitress got a note with her tip. She was super busy and still managed to be friendly. She had earned it, and probably needed a boost to get through the night. I hope it made her smile. Try it sometime – I bet it’ll make you smile, too! 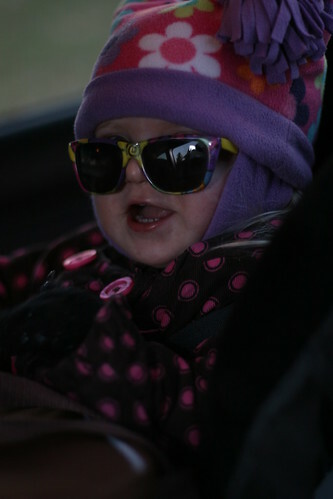 It’s now blatantly obvious – hanging out with Ms. L and heading home with daddy is great fun! 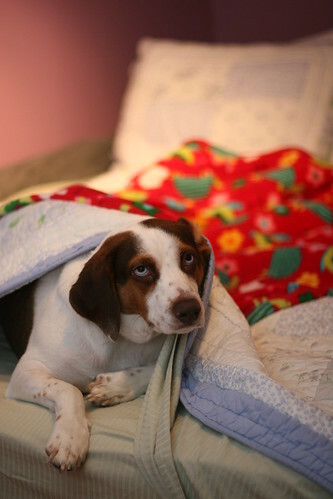 … to make the bed when the dog crawls under the covers at the foot of the bed! Seriously??? What percentage of the gifts you’ll give this holiday season were purchased from local small businesses? This is the first year I’ve focused any of my attention on buying local. And I’m pleased to say that a VERY conservative estimate is 30% from local small business, but it’s likely closer to 40%. It’s nice to meet local shop owners. To get to know store personnel. To know your purchase is making a difference. Shopping at local craft fairs is great, as well! I also did lots of (Er, maybe too much?) shopping on etsy (Okay, not really local, but small business for sure!) as well as in non-local small businesses – a glass shop in Grand Cayman, dive shop in Grand Cayman, and gift shops in both Savannah and Los Angeles. Truthfully, it seems there are more treasures to be found in places like these – more unique items. In some cases, it does cost a bit more to buy local. To me, that’s okay. The service is incredible, and getting to know the people in these shops is priceless. Knowing that I’m making a difference in keeping a small business open – particularly in this economy – is well worth the extra cost. If you don’t already, and if you can, try buying from local small businesses when it makes sense. Swing by a new shop from time to time just because when you have a few minutes to kill. I bet you’ll find that you like it much more than buying from big box retailers or online venues. And please, if you find places you like, take it a step further and share them with others! I’ve been fighting it for days, maybe even weeks. And this morning, after running errands, I pulled in the driveway and lost it. I’m one of those highly sentimental types. I hang on to certain memories forever – both good and bad. I treasure particular gifts, knowing that the giver put their heart into the gift. And I love things with history – treasures passed down through generations. So why did I have a meltdown in the car – in the driveway? I’m so lucky. We’re so blessed. I have an amazing husband who loves us with a most gentle and caring love. I have a daughter who is growing up to fast – she’s perfect to me. I’ve got wonderfully supportive family members – they love me for who I am and accept my shortcomings. I don’t show enough appreciation sometimes – okay, all the time – they’re my rock. We have a solid roof over our heads, are both employed, and are mostly able to provide not only what we need, but what we want, to each other. That’s enough reason for me to become emotional. Reflecting on the true meaning of Christmas, thinking through sacrifices made by so many so that I may sit here today and tell this story to you, makes me emotional. I’m not perfect. And if it were up to me, I wouldn’t give gifts, nor would I choose to receive. I’d want to instead make a personal commitment to continuously become a better person. To give more. To open my heart much more than I do. To think of others more often. To spend time with the people I love the most. And I’d ask the same in return – as my gift from them. I am blessed. We are blessed. And I’m taking the time this year to realize just how beautiful this life is. When I reflect, it’s absolutely overwhelming. Take the time to think through life’s many blessings, and share your love and thankfulness with others this holiday season. You just might make someone’s day, turn someone’s life around, or be a beacon of hope they’ve been looking for. Just love. For the greatest gift isn’t something material you give or receive, the greatest gift is love.